Alabama, Georgia, Missouri, North Carolina, South Carolina, and Virginia. The 2017 Powder Springs, Georgia, Regional was held Sept. 16 at McEachern High School. Harrison won the early-season competition again this year, but Mill Creek was another standout group, winning the visual caption and earning second place overall in prelims and finals. Harrison will once again headline the Powder Springs Regional after winning two of the past three competitions. Last year’s other medalists, Fort Zumwalt North and Blue Springs South, will not be returning to this regional, which leaves the door open for a second straight win and caption sweep at by Harrison. But there are some other notable programs to watch including McEachern and Boiling Springs. The two groups finished fourth and fifth respectively at last year’s event. We expect them to each make strong runs for a top three finish. Making the drive from Virginia, Rock Ridge will look to shake things up in Powder Springs. Rock Ridge placed third overall at the 2016 Monroeville Regional while taking the general effect caption in finals. Jackson County will be another exciting group to watch. 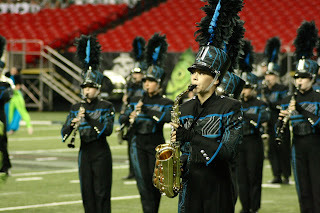 The band made finals last year at the Atlanta Super Regional, and this will be an important year to see how much more progress they can make. We expect the rest of the top ten to include many of the large group of bands that have made finals at this or other regionals in the past two years. This group includes Allatoona (Monroeville 2015), Camdenton (Clarksville 2015 and 2016), Cary (Winston-Salem 2015 and 2016), Kell (Jacksonville 2015 and 2016), Mill Creek (Powder Springs 2016), Milton (Powder Springs 2016), and Saint James School (Jacksonville 2016). Because of low attendance, all thirteen bands will make finals, but we’re only predicting placements for the top 10. Music: Chip Crotts, Glenn Fugett, Monte Mast, and Ronnie Rios. Visual: Austin Greene, Brandon Spidel, and Bob Thomas. I thought Boiling Springs would be at this contest? I heard they recently added it to their schedule. Boiling Springs will be at this contest. It was added late. Who will be in the top three?